Wilbert was the creator of Thomas the Tank Engine. He retired to Rodborough Avenue in 1965 and I have many childhood memories of meeting Wilbert through my father's passion for railways and attending Rodborough Parish Church where both Wilbert and his devoted wife Margaret worshiped. Wilbert was active in the Gloucestershire Society for Industrial Archeology (of which I believe my father was a founding member) and became the Society's President. 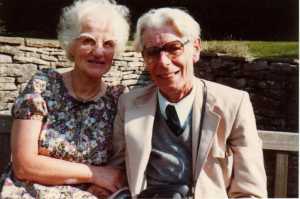 Wilbert Awdry was born in 1911 in Romsey, Hampshire. His father was a clergyman and in 1917 the family moved to Box, Wiltshire in sight of the Great Western Railway mainline. He himself was ordained in 1936 and eventually become parish priest at Kings Norton. A memorial stained glass window, originally intended as a memorial to Margaret Awdry, was installed at Rodborough Parish Church after his death. Brian Sibley wrote a biography - The Thomas the Tank Engine man: the story of the Reverend W Awdry and his really useful engines - published in 1995. This is now out of print but Gloucestershire Libraries have 5 lending copies in the county, including one at Stroud.